Psychologists and philosophers have long been searching for what the basis of human interactions is. 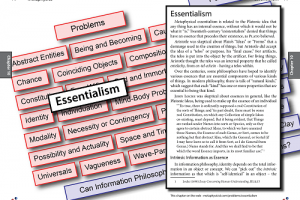 Currently, there are many paradigms, theories, speculations and models, however, one stands out as the most commonly accepted theory, and that is the theory of egoism. There are two perspectives on egoism, the psychological – psychological egoism, and the philosophical – ethical egoism. Here, we’ll discuss each one and their differences. As I briefly mentioned above, psychological egoism is a descriptive theory (meaning a theory based on observation) that is largely regarded as the theory that best explains human behavior. 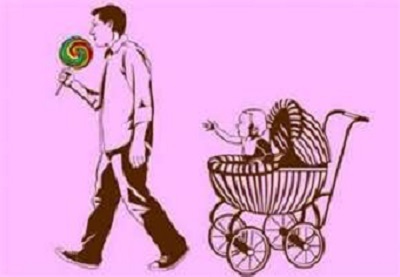 Most psychologists believe that one’s self-interest (or ego) is the foundation of all the interactions that person does. For example, if you were to go to a store to buy some water or groceries, it would be because you felt thirsty or hungry. Similarly, if you went to a doctor, it would be because you were sick. In both these cases, your motivation for doing something arose from the fact that you wanted to do something that was in your best interest. A thing to note here, though, would be that this theory doesn’t state you do what you do for your own short-term satisfaction, quite the opposite – you do it for your long term satisfaction and benefit. As an example, if you were in a store and saw something you really wanted but didn’t have the money for, and you just wanted to experience short-term benefit, then you would steal that thing. This would, however, lead to you getting arrested, so, when looking at it long-term, you would most likely avoid stealing it if possible. And that’s exactly what this theory states – your behavior is led in a way that ensures your long-term satisfaction. 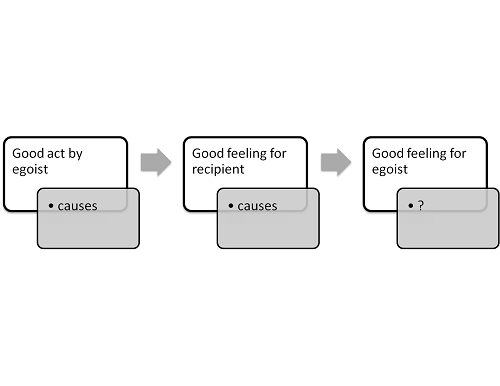 While psychological egoism is a scientific theory based on observation, ethical egoism, on the other hand, is just a philosophical viewpoint on the morality of actions driven by self-interest. Briefly explained, it states that any consequence that was caused by an action driven by self-interest, is necessarily ethical. 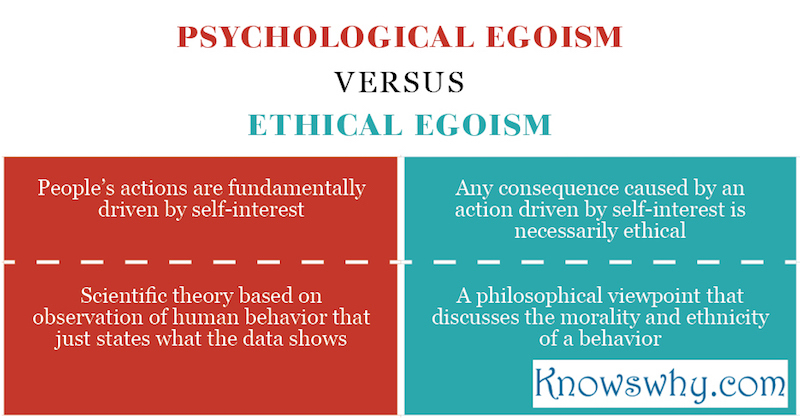 People often confuse psychological and ethical egoism because they have similar definitions regarding a similar area. However, they are two fundamentally different things, and their differences will be discussed below. As I just stated, psychological and ethical egoism are two fundamentally different things. Psychological egoism is a scientific theory that was based on years of observations and collected data, and, as such, it only tries to describe the behavior of people, by stating that it’s fundamentally led by their self-interest. This means that it doesn’t in any way try to give those actions ethical or moral value, or judge them as right or wrong. It just tries to describe reality. Ethical egoism is a completely different thing. It’s not a scientific theory, and it doesn’t try to explain anything. On the contrary, it tries to do what psychological egoism doesn’t – give ethical and moral values to actions (and consequences caused by those actions) that were driven by one’s self-interest. Many interesting moral dilemmas can be found on the Internet. If you take any one of them, and apply your knowledge of psychological egoism, you’ll find out how the “protagonist” of the dilemma should act, but you’ll still most likely feel like that might not exactly be the right choice – no matter what the choice was (if it was a true moral dilemma, you’ll feel that way no matter what you choose). Ethical egoism comes into play here. As a philosophical standpoint, it can give an answer to which of the possibilities the “protagonist” can make is right – and based on the fact that it’s the most moral choice. Finally, one might wonder if one of the two egoisms shown above is more valid or important than the other. The short answer would be – no. A longer explanation would be the following – science, by definition, doesn’t meddle with what’s moral or ethical and what’s not. Its purpose is to show how things are and why they’re like that, nothing more, and nothing less. However, in order to have a stable and healthy society, some moral and ethical norms are necessary, and that’s where philosophy (or ethical egoism, as a special case), comes into play, providing an opinion on exactly that – moral and ethical principles. So neither is more important and both are necessary in order for society and humanity to grow and improve.